Well, since I finally uploaded the rest of the pics from the 2016 season. I thought I'd share them here. In 2016, I attended 84 games in 51 different stadiums in 50 different cities in 9 different states. That brings my lifetime total up to 736 varsity games attended in 231 different stadiums in 210 different cities in 33 different states. My goal is to fill in that giant cluster between Ohio and Pennsylvania with as many 'new' places as I can over the next few years. Though, in 2017, my plans call for trips to Michigan, South Dakota, Indiana, Tennessee, and Florida. Though, South Dakota is the only specific trip to a new state. The trip to Florida will be a round trip with stops in Virginia and Alabama on the way there and back. That will leave only 14 states left that I haven't attended a high school game. And only 9 states I haven't seen ANY game in (professional, collegiate, or high school). Neshannock v. Farrell at Taggart Stadium in New Castle. Overall, the Neshannock-Farrell game just had great coloring and layering. From the vibrant jerseys to the green field, red stands, white houses, green trees, and blue sky. Everything just stacked atop the other perfectly. Weirton Madonna (WV) v. Oak Glen (WV) at Jimmy Carey Stadium in Weirton, WV. The sky overlooking Ohio from the West Virginia hilltops. 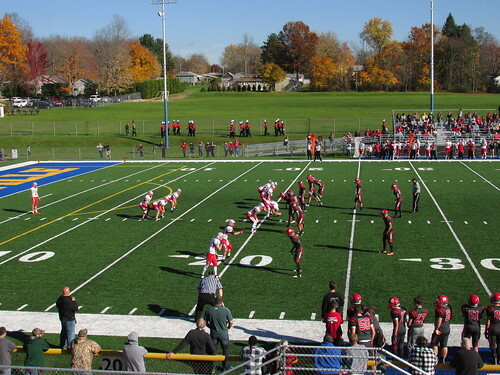 Garrettsville Garfield v. Mantua Crestwood at JAG Field in Garrettsville, OH. 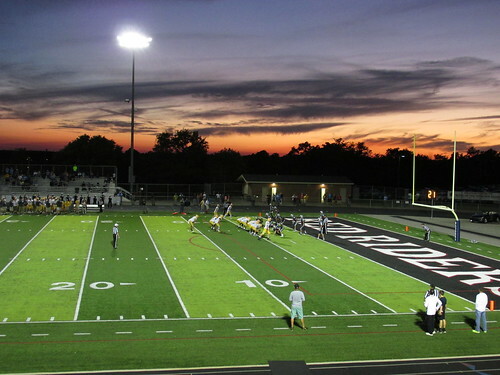 A small, wooden-slat stadium in the heart of Ohio, hosting two rivals in a big game. Beautiful day and evening. Imani Christian v. Springdale at Graham Field in Wilkinsburg, PA. Rain. Weather. Mud. And a roofed stadium. 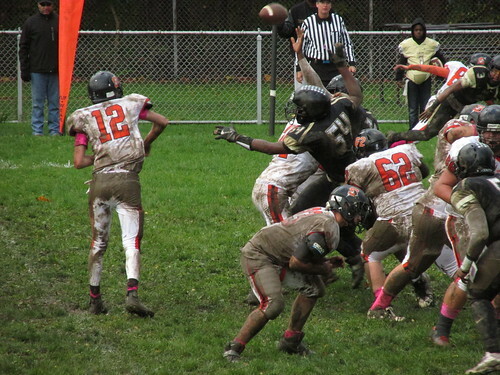 The natural grass field just can't be beat when it comes to a rain-soaked game. And this one didn't disappoint. 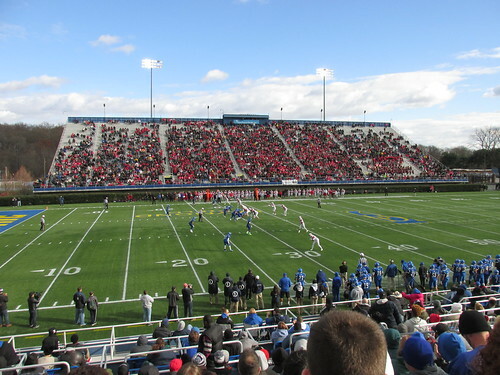 DIAA Championships, Delaware Stadium, Newark, DE. Huge crowd in Delaware was quite surprising. More fans were streaming in after this photo. Beautiful late fall afternoon. 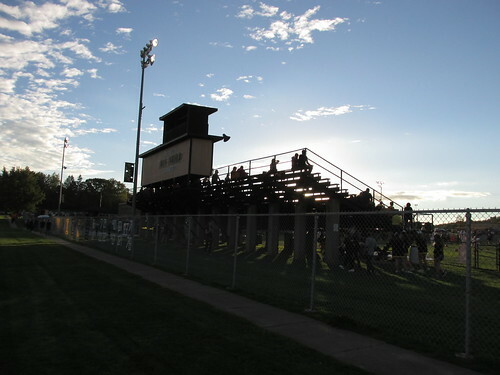 Hickory v. Slippery Rock, Snyder-Stone Stadium, Greenville, PA.
Clear skies. Vibrant colors. Just a great afternoon playoff game in Greenville. Fort Cherry v. Sto-Rox, Jim Garry Stadium, McDonald, PA. Arriving at the game, this was the general view as you park on the hillside overlooking the field. But with the hustle and bustle of people moving through the lot and the stadium and sidelines filling up, it didn't look great. Several hours later, the game well over, the crowd removed, the crew and helpers filing out. The teams and their buses having departed. Just a few still there. 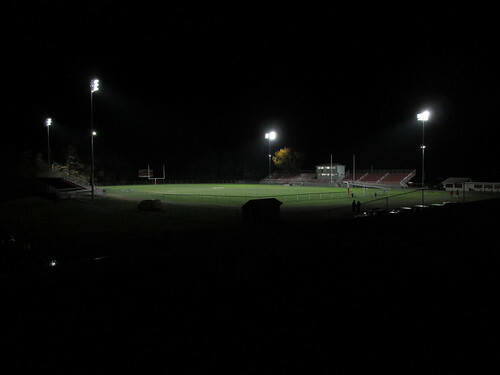 Not long before the lights get turned off for another season. I will try to get videos up later this year on Youtube. But, for now, I'm not planning on doing much. Instead, the 2017 season is right around the corner.